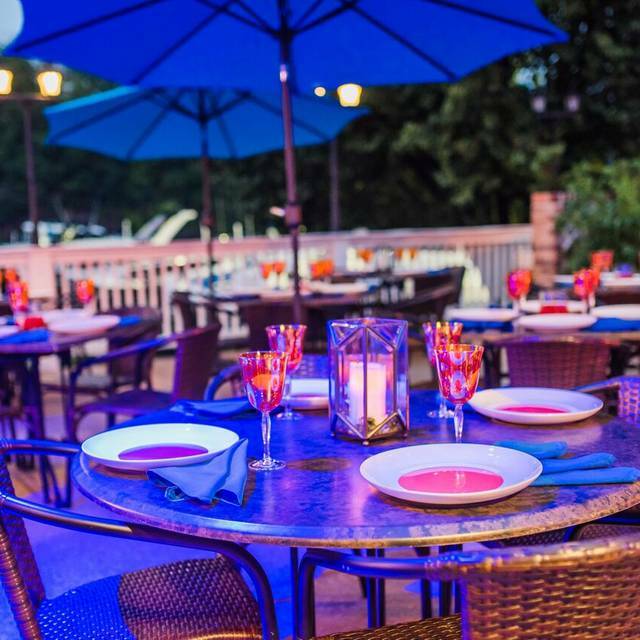 A view of the Potomac River and a delectable meal are two things you are guaranteed when you dine at Blu 1681. 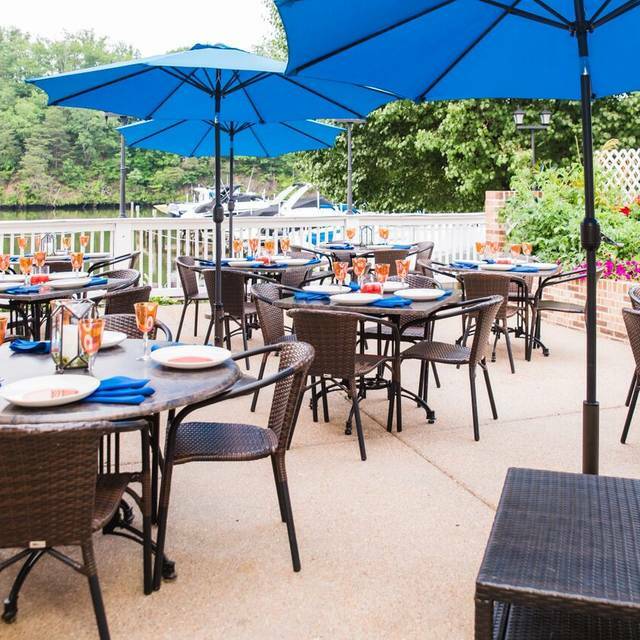 The huge deck and the large dining room offer gorgeous waterfront views no matter where you enjoy your meal. 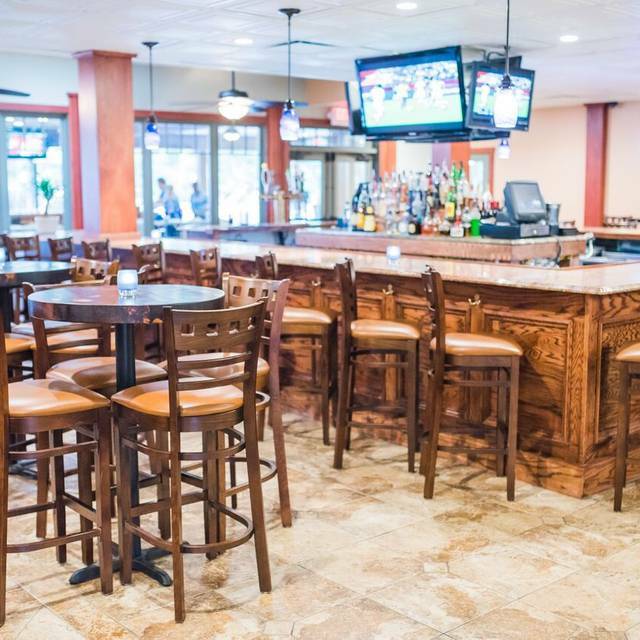 The helpful staff will enhance your dining experience whether you are just visiting Blu 1681 for dinner or hosting a private event in the banquet space. The menu at Blu 1681 features unique contemporary seafood entrées such as Creole grilled octopus and crab cake sliders. Seafood is not the only option. Blackened chicken penne pasta and prime rib are just two of the many non-seafood options they offer. 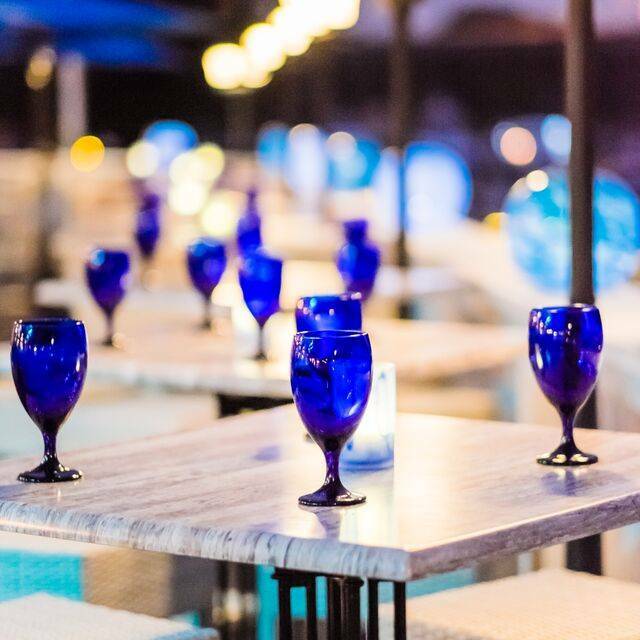 Between the stunning scenery and delectable dishes, a night at Blu 1681 will not disappoint. BLU 1681 has three attractive Private Banquet options and caters to all types of events from Deck Parties to Yacht Club Gatherings and Family Reunions including Birthday and Anniversary Celebrations. We have great venues for small to medium Weddings. 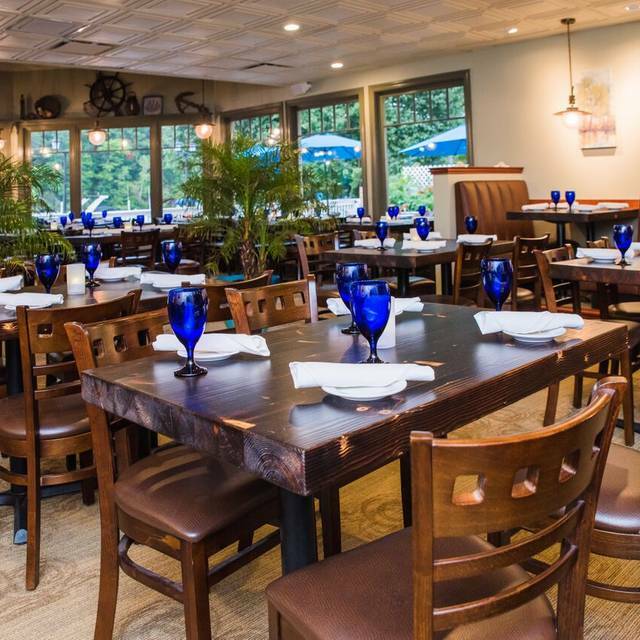 BLU 1681 at Occoquan Harbour Marina offers an 120 seat formal dining room, adjacent to a nautical themed bar with flat screen televisions. Two of our private dining room can accommodate up to 50 and one of the rooms features a private patio which can seat up to an additional 40 guests. 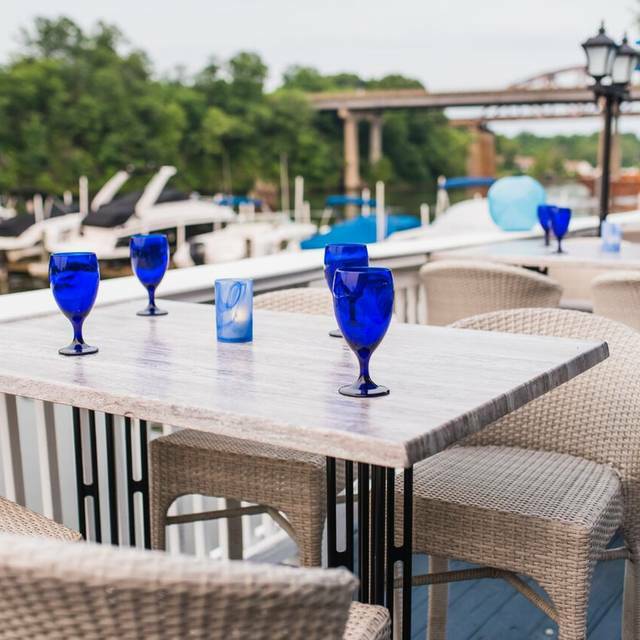 Outside, our “Front Porch” is a fully covered outdoor dining experience accommodating up to 60, and our expansive outdoor deck has it’s own Tiki Bar, seating for 120, with the best view on the Occoquan. We offer a unique Boaters Basket package as well as menu selections which can be delivered or picked up from the restaurant. There is ample parking directly in front of the restaurant. We had a reservation for 20 people for dinner last Friday night. We all arrived and they had no record of the reservation. There was a large, very loud party going on in a side room at the same time. They took 45 minutes to set up our tables. We had to send glassware back because it still had lipstick on it from the last user. The water tasted horrid. The sodas were flat, then they ran out. They had no canned option for soda. The food took over an hour to come out and tasted HORRID! We had a 6:30 reservation and did not get food until 8:30. The filet mignon and lobster tails were cooked perfectly and tasted great. We could not have asked for any better service. We liked sitting outside on a warm day in March. The view is of docked boats and I-395 and US Rte 1 bridges over the Occaquan River, but things are always moving. Food good. Service bad. The service does not reflect the yummy food. A lot of chaos. Service you would expect from iHop on a Sunday morning. Beautiful place to eat outside on deck of marina! Plenty of peacocks to watch too! Server was pleasant and knowledgeable of specials. Service was great to begin with but got delayed over time. Broiled shrimp in butter was excellent. Burger night on Tuesdays and Angus Burger was good. Able to substitute fries for alternatives including vegetables. Sautéed garlic spinach was good. They have happy hour too throughout restaurant from 3 to 7. We were invited by a neighbor who also played the saxophone for the club. We went on a Sunday morning and ended up in the brunch crowd much to our surprise. We were not sure what to expect when we got there so the brunch was a little bit of a surprise. The food was pretty good. We ordered omelettes and they informed us that they would take some time so we hit the brunch line. Good options for food and quite a good selection. Our omelettes arrived and they were huge. Could not finish them as I had food from the buffet already. Also, they messed up my omelet option; fortunately I was not too concerned but I wondered if mine was incorrect then the ripple affect meant that at least one other person did not get the correct omelet order. We then went into the bar section to listen to the music and our food came with us. All in all a pretty good experience and the food was not bad. I tried some sausage gumbo that was really good. The Sunday buffet was OK, the food was well prepared and kept filled. The omelet line was well managed with order cards. Food was good. Very noisy party was onsite...that was first on the patio then came inside by the bar. Cursing, yelling across the room, etc. Pretty much ruined the whole experience. This place was horrible. The service, the food, the set up...everything was horrible. And I think the thing that got me the most was that no one seemed to care that they were serving mediocre food with poor service skills. Absolutely will not go back. My husband and I joined several of our neighbors for brunch. We were seated near the buffet, which was nice since we didn't have to travel far for food! The food was delicious, the mimosas and bloody Marys were great. The desserts, however, were only so-so. They were a little disappointing. The only real complaint was that the omelet maker didn't seem to know what she was doing so the line backed up quickly. I was told that she was soon replaced and we got our omelets not loo long after that. Even though this restaurant is one of our fav's the VDay Brunch was disappointing at best. One hour to get an omelette, ran out of plates, ran out of main dish on buffet w/long wait to refill. The selection of bread on the buffet was two store bought sandwich bread loafs displayed in the original plastic wrap, not very creative there! Have been to this restaurant many times before and it was good, failed terribly for this special event. 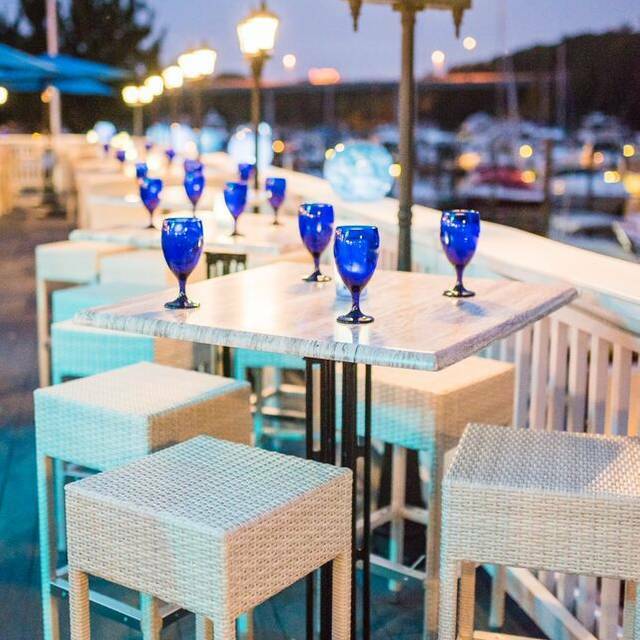 Great spot for outdoor dining in warm months though, overlooks the marina with great ambiance. Went for Valentine's Day Brunch. The decor was great- red tablecloths and flowers. Staff seemed overwhelmed by the number of guests and were still running around getting things set up after opening. Food was served in a buffet, as well as made to order omelets and red velvet waffles. The food was very good, but omelets took at least 20 minutes. Despite ordering omelets and waffles at the table, they were being prepared at the bar on small cooktops. Waffle arrived cool enough that butter wouldn't melt on it. Coffee also took at least 10 minutes to be served- mine was hot while my wife's was lukewarm at best. Music was being played over a speaker in our dining room, but different music was being played over speakers in the adjacent bar area and the two clashed and interfered with each other. Overall we enjoyed the food and the atmosphere, but the lack of attention to detail makes us question a return trip. Food was awesome. We joined Blu for 5-course Vday (2/13/16) Dinner which was a great find, but it seemed as the staff was overworked for the group they were preparing for. Reservstions was fairly easy, staff was friendly. Food was worth the waiting. We will be repeat customers. Thanks for having us! I was unimpressed by the overall experience. Our reservation was at 6:30PM, we did not receive our meals until 8:45PM. The wait time was ridiculous, and the communication was ineffective about the wait time. Our family and friends wanted to have a Super Bowl party at our house but instead decided to have an impromptu Super Bowl party at Blu 1681. The service was great, and with all the televisions there was an excellent view from any where in the restaurant so we didn't miss a play. We enjoyed the food and the fun. Our server was very good, but overall the food was a disappointment. We ordered 2 filets and also a scallop entrée. One filet was ordered medium and the other was requested rare. The medium steak was not at all pink in the middle and the rare steak was more medium with a touch of pink. The server took away the rare steak and brought another. The second steak was cooked rare, but it was also not as tender as the other with "gristly" (sp?) edges/ends. Both steaks had a strong charred/burnt flavor even though they were not burnt, only seared on the outside. We also had a shrimp appetizer and a crab cake appetizer--both were okay--not spectacular. The risotto (or whatever was with the scallops) was very cheesy and also had bacon and was overwhelmingly rich. The crab macaroni and cheese side served with one of the steaks was a hit as were the waffle fries. The sides with the other steak- sautéed spinach and sautéed mushrooms were both average. This was a special dinner out with our 20 year old granddaughter before she returned home. She had requested steak and some friends had told us they recently had steaks at Blu 1621 that were excellent. We ate there on a Thursday night and I am guessing it is not the same chef as was on duty when our friends were there. The bright spot of the night was our server, who was EXCELLENT! Previously dined here in Summer and it was packed due to location at Marina. Tonight very few were there. Hampton Inn gave free appetizer coupon. Staff very friendly but all were relatively new so could not answer many questions but once again helpful and professional. Their broiled shrimp were excellent! Someone recommended their crab cakes so ordered. Although tasty and not too much filling, they were lukewarm. I'd order again but request they be heated more next time. I'd go back again! We ate here most recently for Sunday Brunch which was very well priced for all that was offered. We have also eaten here in the evening on weekends. Food is well prepared; the restaurant has good ambiance and is fun for dining outside during warm weather. Good seafood selections. We went looking for a good seafood dinner and left unsatisfied. We ordered crab legs and steamed shrimp for appetizers. We ended up sending the first batch of crab legs back because they were dry and overcooked. The second set of crab legs came back marginally better but not good. We were hungry so we ate them rather than sending them back again. They seemed almost as if they were pre-cooked and then reheated. The steamed shrimp were tasty enough, yet small. For dinner my date ordered the jambalaya and was happy with it. I ordered a full rack of baby back ribs with a side of sautéed spinach and lobster macaroni and cheese. The ribs were tasty but the mac & cheese had very little lobster and no lobster flavor. The most enjoyable part of the meal was the sautéed spinach. It was not swimming in butter and had a perfect amount of fresh garlic. We each enjoyed a glass of the house Malbec. Overall, we were nonplussed with the seafood, but we'll try again for lunch/Sunday brunch. -No reception or server at the front. Waited 5 minutes while bar tender and wait staff seemed to notice but ignored our arrival. Several bar patrons noticed our arrival and continually glanced over at us to see if we had been helped. Eventually one of the patrons went and got a staff member (we didn't know where the dining room was) and the server came out to greet us. -No silverware was given to us. After the appetizer arrived, my dining guest went to another table to get the silverware. -Food and drinks took longer then they should have. And not just for us, other tables with completely different wait staff were without drinks for over 10 minutes. After we had been seated for about 30 minutes, table that had arrived before us still didn't have food. Our food took about 30 minutes. The server voiced her frustration with the kitchen to us; we didn't mind the wait but it all seemed unorganized. -The food was good but the experience/wait, etc were enough that I wouldn't want to try it again a second time. This was my second visit to Blu 1681. We decided to attend the New Year's eve event since it was kid friendly. The buffet, while pricey, was absolutely outstanding--and worth it! The service was not 100% as far as having a personal server for the table, but they certainly did their best. The entire staff was very friendly. The music for the most part was kid friendly--with the exception of a few songs. Overall, it was a great evening and a fun way to ring in the New Year with family! Kudos the the Blu 1681 team. We were at Blu's New Year's Eve Party. The food was really quite wonderful and the service was spot on. The basis of our lower marks was the DJ. He played music most of the evening that was geared to 20 year olds and he had a party whose average age was most likely in the low 40s. He talked, more like mumbled, all night long and we were pretty disappointed. Please fix the music Blu and we will come back. New Years event...although service was great, and you guys was extremely busy, the waiter did forget my drink, and this just means the waiters need to be trained on large crowds or the restaurant need to add additional waiters for functions like this. I have been to Blu many times since they opened and I never had a bad meal from them. The servers were friendly, the New Years Eve buffet was busy but kept up. The was a great variety of foods and was delicious. Would go back again for New Years Eve. Wonderful New Year's Eve celebration!! I'm not from the area and we picked this place on a whim. The staff was super friendly and the food was amazing. We spoke of making it a regular hang out! Despite having an early reservation, when we arrived on time at 5:30, we were told the only seats available were in the bar.it was extremely noisy and crowded, we had trouble talking to each other across the table. The food was mediocre and the service poor. This place is best during the summer and early Fall. Although I made reservations, I was not able to celebrate a friend's birthday on December 10, 2015. First we seated ourselves and then sat for 10 minutes before someone from the bar came to assist us. I've had good service while the weather was warm, but now it seems the staff is slim as well as the patrons. I did not attempt to stay for food since the service was so bad. Discovered this restaurant on OpenTable and decided to try it because my wife and I are always looking for good seafood. We've been to a lot of restaurants in the area, but for some reason, we had never heard of this restaurant. I think it used to be a different restaurant, but it looked fairly new and the decor was very nice. We went on a Monday night in November, so it was nearly empty, but the restaurant is located right on the water (Occoquan River) so I'm sure it's busy in the spring and summer. The food and service were great. I saw several items on the menu that I want to try, so we will definitely be visiting again. I have had many positive visits to this restaurant before. However, on this day, service was poor, our food was substandard and cold. And since there were only three tables occupied at the time, I would have expected much better service. Our waitress said she couldn't find the bartender, so our food was delivered before our drinks were. I have recommended this restaurant to many of my friends, and on this day I brought out-of-town guests. It was quite embarrassing. It will be a while before I return here. 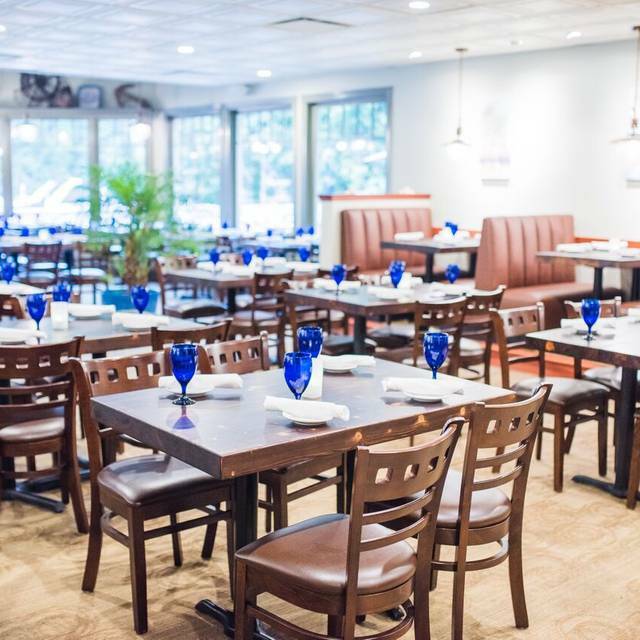 For those of us that live in Southeastern Fairfax County or near-in Prince William County, it is a joy to finally have a restaurant you would recommend to your family and friends. 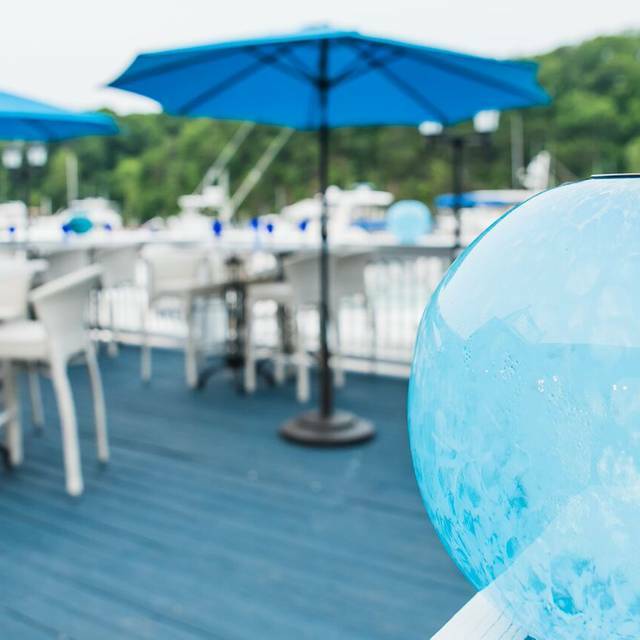 The location on the Occoquan River with a breathtaking view from the white and blue themed deck compares to any we have enjoyed on our travels around the country. The menu is varied with something for everyone...those coming off their boats or there for a special occasion. The food is excellent and the servers are quick to assist with making helpful suggestions. Bob, our most recent server, even whipped up his own favorite combo sauce for my husband to try. Our garden club lunched there this week and gave rave reviews for the mango-crab salad served in an avocado shell! Food is always excellent. The crab cakes are some of the best I've ever had...no fillers. Good service and pleasant Jamaican music made for an enjoyable evening on the marina. They closed the kitchen early and did not know about my reservation. It was my mother's 66th birthday. We left without dining because they told us the kitchen would be closed in 30 minutes. It was 8:30 on a Thursday. The signs are poor, it is hard to find, and dark (no street lights)!! Enjoyed the food with My Husband Birthday. I wanled to take him somewhere special and found this spot on open table. The crab sliders are awesome and lamb burger salad was great! Will be coming back. Thank you . The appetizers were good (catfish bites and crab croquettes Steak and gee and were way too salty. Last shift bartenders couldn't figure out how to make a Mai tai or a whisky sour. It was a mediocre experience over all. I was kind of disappointed. I am not sure if we will return. The Prime Rib was overcooked but the waitress took care of it and the manager was very accommodating. Will be back but will probably avoid this dish. It was my first time at Blu 1681 and I was very satisfied with the food, the ambiance, and the service. I will definitely be returning. We had fantastic service from Winston. That guy was the only thing that kept my from giving this place a single star. He made the experience tolerable. I haven't been disappointed in everything the came from the kitchen in a while. Every plate was overdone. Chicken tenders, dry. Fish, dry. Risotto, dry. Scallops and shrimp, bouncy. Iced tea, instant... I'm done. Definitely not going back there again. Great service from wait staff but kitchen was horribly slow. Waiter tried his best to accommodate but the more he tried, longer it took to get the food. Food was good but would have been a lot better if wouldn't have took so long to receive it. Food and service was wonderful. I highly recommend the crabcakes! My only suggestion would be to have a bit more lighting. Our table out on the patio was quite dark and it was hard to see the food we were eating. Other than that everything was fabulous!